When I was 19, my dad told me and my 16-year-old sister that he wanted to take us on one last trip before we were grown up and out of the house. After much back and forth, we decided on Morocco because it was exotic, yet offered a familiarity that we were comfortable with. My sister brought along a friend, and the four of us headed off to Northern Africa. We started the trip in Fez, and visited Casablanca before heading to Marrakesh. 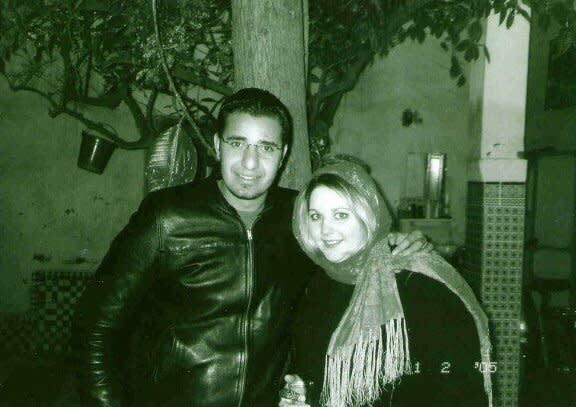 It was the day before New Year’s Eve, and while touring the city, my sister met a guy in the souk who spoke English, which was uncommon at that time in Morocco. Like your typical teen who’s on vacation in another country, she told him where we were staying and suggested he stop by later that day. That evening, when we walked out of our riad, my father and I were surprised to see the young man standing there and waiting for my sister. They hung out for a while before the guy called a buddy to keep her friend company. Youssef was there to keep my sister’s friend company, but as it turns out, he didn’t speak English. Luckily, I had taken some French in high school (French is the 2nd most popular language in Morocco), so he and I were able to communicate and I functioned as a translator. My crush on Youssef continued to grow, and at the and of the day I knew that I wanted to see him again. I asked my sister’s friend if she liked him, and she said she wasn’t interested. The coast was clear. The next day Youssef and I met up, and spent New Year’s Eve talking and exploring the city — I even met his mom! The following day, me and my family had to continue on our trip through Morocco, and I had to say goodbye to Youssef. I had fun with him and was sad to leave, but I didn’t think things would go any further seeing that I lived thousands of miles away. 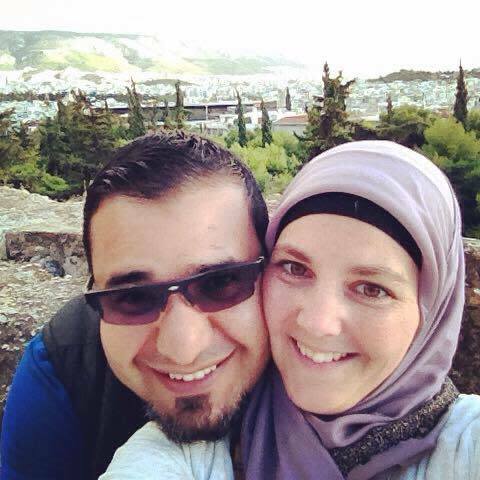 We exchanged contact information, and we started emailing when I returned to the U.S. We wanted to see each other, but in 2005 there was zero chance that a Muslim man from Morocco would get a visa. So, he kept asking me to visit him, and I was crazy enough to do it. For spring break I booked a flight back to Marrakesh. I stayed with Youssef and his family who were so kind and welcomed me into their home. I was only at his house for about four hours before Youssef proposed to me. For Americans, this sounds crazy. But in Youssef’s culture, it’s not unheard of because you simply don’t spend time with someone you don’t intend to marry. I said yes because Youssef is such an amazing man. I’m very extroverted, and he’s much more reserved and quite. We couldn’t be more different, but we are the perfect balance for each other. Every time he looked at me, I could see that he had nothing but love in his eyes. He lit up, and his gentle nature and kindness made it hard not to love him. We spent the next week together before I went back home. I knew that if I was going to make such a commitment, that I needed to get to know him better. So, I went back to Morocco over the summer and spent six weeks with Youssef. We had an amazing time, and by the end of that trip I was sure he was the one. We had applied for a fiancé visa after he proposed, and in Dec. 2005 he had his interview. They quickly granted the request, and the next day Youssef was able to get his visa. I know that my family wasn’t super thrilled about me getting married. However, my parents have always trusted me and given me the freedom to make my own choices. 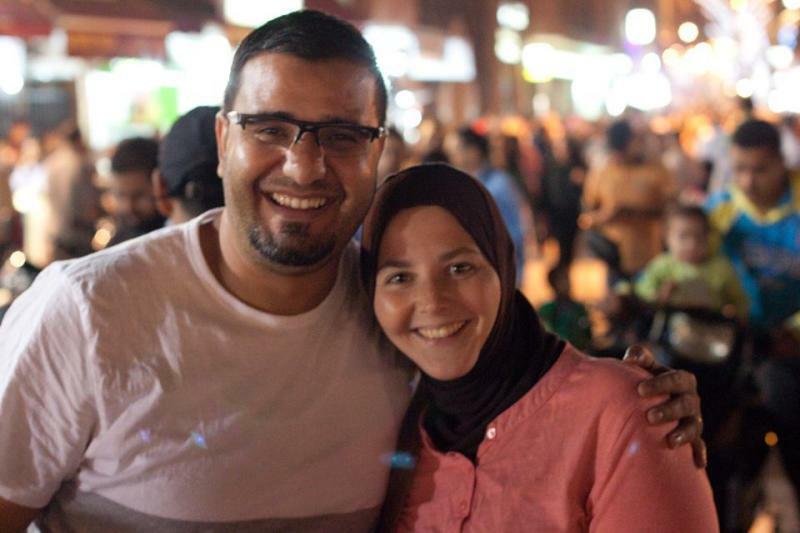 I met Youssef at a particularly rough time, when American’s had negative views of muslims. A lot of people had discouraging things to say to me and I’ve heard every stereotype in the book. But none of them knew Youssef, and I knew that he was a good man who would love and take care of me forever. A fiancé visa only gives you 90 days to get married, so we didn’t really have time to plan a major event. Instead, we went to the Upper Peninsula of Michigan (where I’m from) and said our “I do’s” in front of 100 guests. The ceremony was primarily western —I wore a white dress and he wore a tux. However, we had a judge officiate and he was gracious enough to blend in our faith customs since I had just converted to Islam. In morocco, the bride and groom feed each other a date and sweet milk to symbolize sweetness and purity in the marriage, and we made that a part of the ceremony. We also don’t drink alcohol, so we didn’t do a champagne toast. Instead, Youssef brought about 200 tea glasses from home and we made a traditional Moroccan mint tea toast. The guests got to keep the glasses as a souvenir. 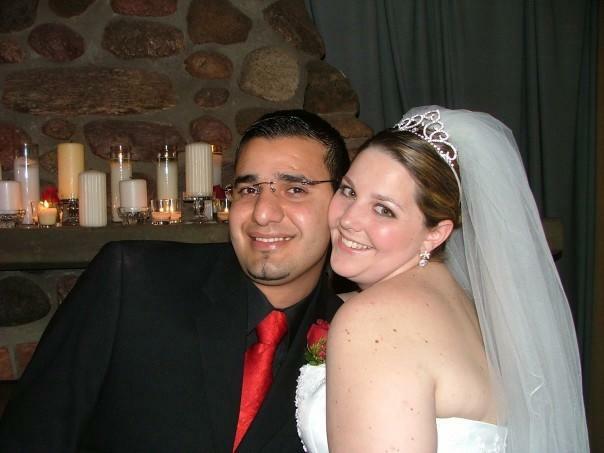 After we got married, we lived in Wisconsin and D.C. while we started our family. 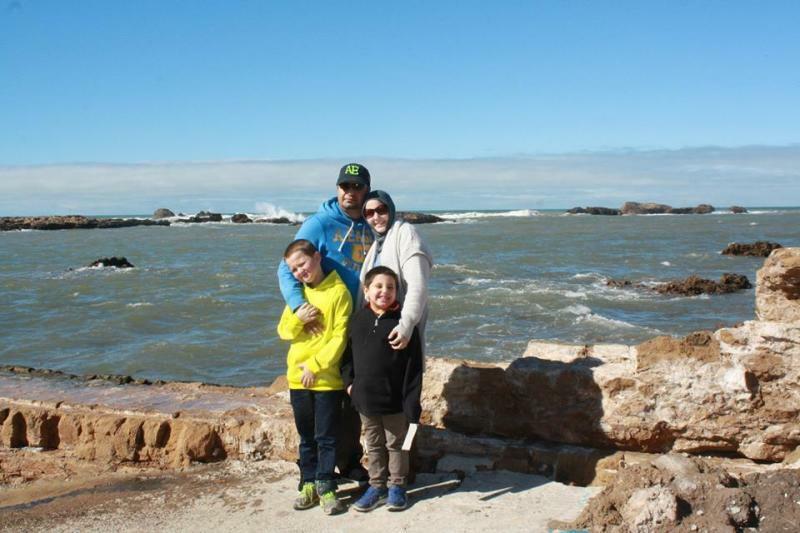 Youssef and I have two sons, and as they got older, we wanted them have a relationship with their family in Morocco. We also wanted them to learn Arabic and French, so in 2013 we made the move to Marrakesh. I’m a born adventurer who loves to see new places and meet new people, but the move to Marrakesh has been an adjustment. Most of all, I miss the seasons. It’s always hot here! Still, I think it’s the best move for my family, and I’m enjoying the journey. 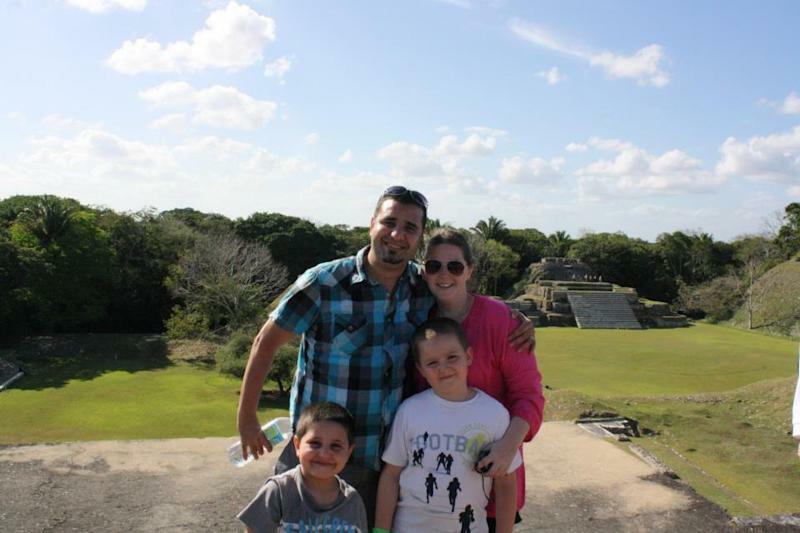 When I look back at how I met Youssef, the mom in me knows that it was a little crazy. But at the time, I didn’t think it was odd. I think it was God’s plan that I ended up in Morocco, and when I met Youssef, I decided to go with my gut. Looking back, it’s very clear to me that it was all meant to be. And today, with our family, we couldn’t be happier.